Kamaboko, or Japanese fish cake, is both a traditional food and ingredient used in many different dishes and is what is used to make imitation crab. It is made from a white fish paste (called surimi) that is either steamed, grilled, fried, or boiled. There are many different types of kamaboko that are commonly enjoyed in Japanese cuisine, from red to pink and white swirled to rolled into tube shapes. Kamaboko is readily available pre-made for sale at Japanese grocery stores as well as other Asian supermarkets. Red kamaboko (fish cake) is one of the most basic of Japanese fish cakes and is used as a topping for soups such as ramen, udon, and soba. Although it is referred to as red, in reality, it is a shade of pink. It is also known as "aka kamaboko" in Japanese. This type of kamaboko is steamed on a small wood board. 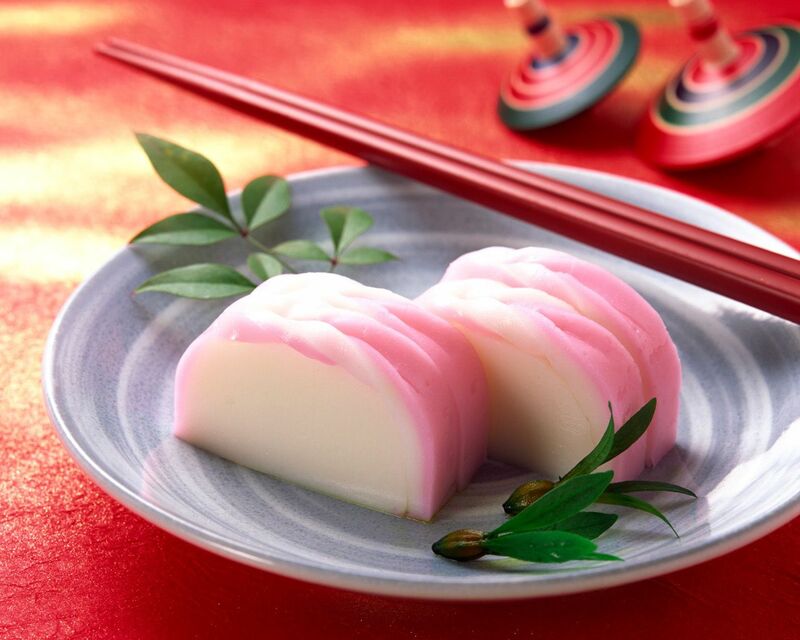 White kamaboko is second in popularity to red kamaboko; it is all white in color and steamed. Other variations of white kamaboko are also similarly steamed, but then the top of the cylindrical fish cake is grilled to create a slightly golden brown exterior. Naruto kamaboko is famous for its beautiful pink and white swirl and an exterior that has tiny ridges. When naruto is sliced, it creates a beautiful pattern that adds to the presentation of any dish that it garnishes. Naruto fish cake is often used as a garnish in soup or chirashi (scattered) sushi. Chikuwa is a grilled fish cake that has a toasty flavor. It is shaped into a long, cylindrical tube that is hollow on the inside. Chikuwa is often added to Japanese stew such as oden and used as an ingredient in dishes such as chikuwa tempura or sauteed chikuwa in kabayaki sauce. Satsuma age is a deep-fried fish cake. It is available plain made with simple white fish, or mixed with other ingredients such as vegetables (carrots or gobo burdock root) or seafood to create different flavors of satsuma age. This deep-fried fish cake is often added to a stir-fry, hot udon noodles, and Japanese stew such as oden, or enjoyed as is. Hanpen is a white, triangular fish cake that is a mixture of white fish and nagaimo Japanese mountain yam, creating a texture that is lighter and fluffier. What adds to the unique fluffy texture of hanpen is that this fish cake is boiled rather than steamed. Hanpen can also be square or round and may include added ingredients to change its flavor, such as ginger, mugwort, or shiso perilla leaf. Konbumaki kamaboko are fish cakes that have a very thin layer of kelp inside. To make the fancy design, the fish cake paste is rolled with the kelp to create a swirl when the fish cake is sliced. This type of konbumaki fish cake is slightly more expensive than red or white fish cake and is often served on special occasions such as Japanese New Year as part of the osechi ryori feast. Sasa kamaboko originated from the Miyagi Prefecture of Japan and is considered a specialty of the region. The fish cakes are shaped like the leaves of bamboo and are often served toasted to impart a warm roasted flavor. Sasa kamaboko is usually enjoyed on its own and is a popular gift when folks visit Miyagi. Specialty kamaboko is steamed cylinder shaped kamaboko, and when sliced, present beautiful designs such as trees, flowers, intricate kanji (Chinese characters), or other art, such as animals. Specialty kamaboko is often served as part of osechi ryori, or Japanese New Year's food. Kani kamaboko is popularly referred to as imitation crab but is, in fact, a type of fish cake that is made of white fish but seasoned with the liquid of crabs. Kani kamaboko is popularly used in westernized sushi as an ingredient in California sushi rolls.